Ask Santa for an Oculus Rift this Christmas. All of a sudden the Oculus Rift has a lot more competition to deal with, thanks to the arrival of the HTC Vive and rivals such as the Sony Morpheus inching closer to a consumer release. So how will Oculus react? Oculus inventor Palmer Luckey has been chatting at SXSW and revealing a few interesting tidbits about the development of the VR device. During the panel discussion he confirmed the 2015 release date... kind of. "I'm pretty confident," he said regarding a 2015 consumer launch. "But that could change. I'd love for it to change because it means there is something even better out there. But I think that's unlikely right now." Luckey also said he was excited about seeing VR content that has previously been "under wraps" go public during the course of 2015 - that sounds like there are a lot of futuristic virtual reality games to look forward to. "Us partnering with Facebook has allowed us to do a lot of things we wouldn't have been able to do otherwise," said Luckey. "I can't comment on the date one way or another, in either direction, but I can say that nothing is going horribly wrong. Everything is going horribly right." Asked about the HoloLens, Luckey said that the best VR headsets would eventually include fully immersive experiences as well as augmented reality overlays that fit on top of the real world. 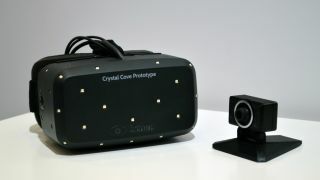 He added that the team was busy trying to "nail" an intuitive input system for the Oculus Rift. Maybe Valve has a few pointers?